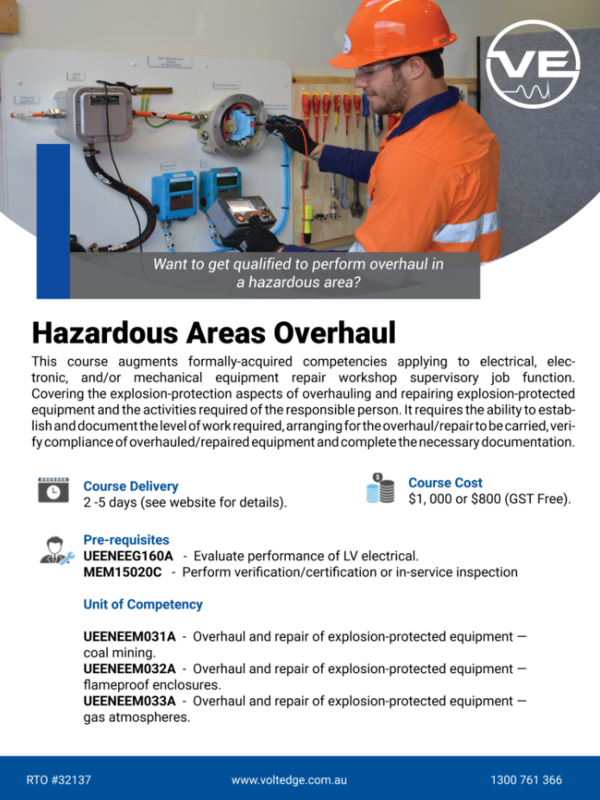 This course augments formally-acquired competencies applying to electrical, electronic, and/or mechanical equipment repair workshop supervisory job function. Covering the explosion-protection aspects of overhauling and repairing explosion-protected equipment and the activities required of the responsible person. It requires the ability to establish and document the level of work required, arranging for the overhaul/repair to be carried, verify compliance of overhauled/repaired equipment and complete the necessary documentation. This course is delivered face to face at one of our onsite locations. We offer 5 different Overhaul options. Each course varies in duration. → Overhaul – 5 days (If completed EEHA with another provider or not at all). → Overhaul – 3 days (If completed EEHA with Volt Edge within 2 years). → Overhaul – Refresher 2 days (If completed Overhaul previously). → EEM Overhaul – 5 days (Not completed EEHA previously). → EEM Overhaul – 3 days (If completed EEHA with Volt Edge in past 2 years). Compile and produce appropriate documentation of work operations. Benefit from the close and detailed guidance of our trainers in person. If you know what to look for, you can work smarter, safer and be more productive. Apply higher-level order thinking skills to promote workplace initiative and resolution. Overhaul and repair of explosion-protected equipment — coal mining. Overhaul and repair of explosion-protected equipment — flameproof enclosures. Overhaul and repair of explosion-protected equipment — gas atmospheres. UEENEEG160A – Evaluate performance of LV electrical. Overhaul – 5 days: $ 2,400. → If completed EEHA with another provider or not at all. Overhaul – 3 days – $ 1,900. → If completed EEHA with Volt Edge within 2 years. Overhaul – Refresher 2 days – $ 1,100. → If completed Overhaul previously. EEM Overhaul – 5 days – $ 2,400. → Not completed EEHA previously. EEM Overhaul – 3 days – $ 1,900. → If completed EEHA with Volt Edge in past 2 years. → Verify that equipment complies with original certification. → Establish the level of overhaul required. → Prepare for overhaul/repair of equipment. If you want to download a flyer for this course, click here. As the Managing Director (and owner), Tony has 25+ years’ experience in both the mining and LNG industries. He has been training EEHA and HV since 2009. Tony is the Author of the Training material. Being a Hazardous Areas specialist, Mark has 10+ years’ experience with engineering of Hazardous Areas. As a licensed electrician, Wes has 30+ years’ experience in the industrial, resource and mining sectors. With over 15 years in the electrical field, Grant has specialised in HA construction for oil and gas.